"Music is my thing," says Marc Gunther, who left his Leave-it-to-Beaver childhood and religious-studies BA behind in Connecticut when he moved west and adopted the band-name Marc Time to play drums with The Jars in SF. "We opened for The Dead Kennedys." A record collector since childhood, Time was a DJ in college, then introduced punk rock to UC Berkeley's KALX in the mid-70s. As the Reverend Marc Time, he launched his Sunday Morning Hangover music and talk show on UO radio station KWVA shortly after moving to Junction City with his wife Barbara in 2002. "I'll be a celebrity judge at this year's slug queen contest," he notes. In January of this year, after he had posted photos of empty downtown storefronts on facebook, Time met with artist Peter Herley and photographer Paula Goodbar to found the Eugene Storefront Art Project. 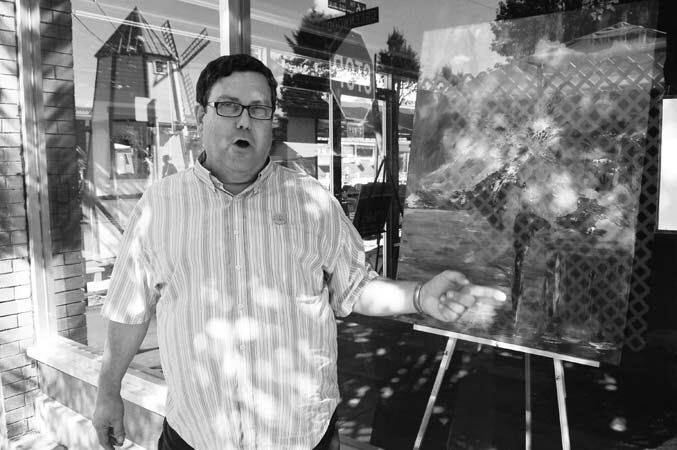 Since March 1, when sculptor David Miller installed the first exhibit at 857 Willamette, ESAP has sponsored 15 exhibits by 30 local artists in the windows of vacant stores. In the photograph, Time points out the work of Junction City artist Sandra Kay Bulley, on view at 187 6th Avenue in Junction City, ESAP's first exhibit outside Eugene. Keep track of ESAP at esapblog.blogspot.com.